The Dominion of Canada Insurance Company. Station counter sign and rate card. New Brunswick postage stamp featuring a steam locomotive. Canadian Railway News restaurant coupon booklet. Virtual collection. CPR Trip Ticket book of Toronto fireman Ray Bossi for 1949. CP Telegraph telegrams over the years. CPR Ontario District Time Table 130 effective April 26th,1959. CPR Ontario Division Time Table No.15 effective June 6th. 1909. Great Western Railway of Canada 1867 working time table. Canadian Pacific Posters some examples of the monthly advertising posters displayed in a special frame in station waiting rooms. Original size: 2 feet x 3 feet. 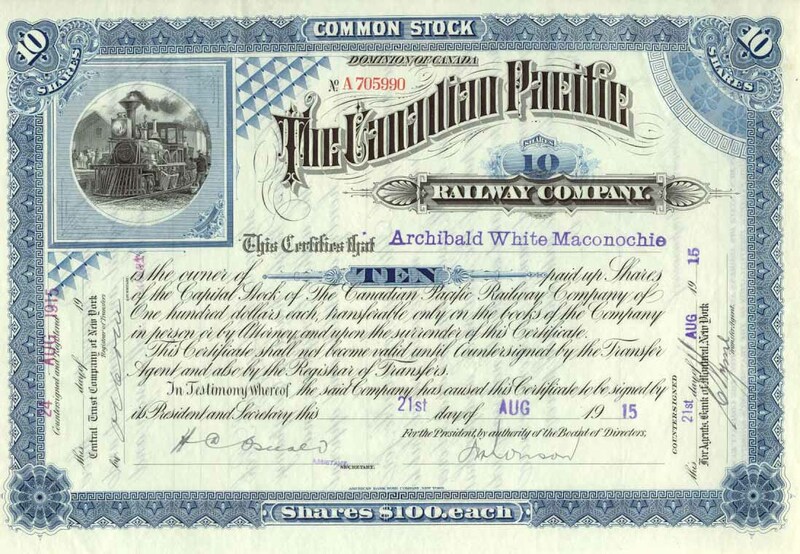 Canadian Pacific Railway stock certificate of 1915. One of the most beautiful engraved certificates ever seen. 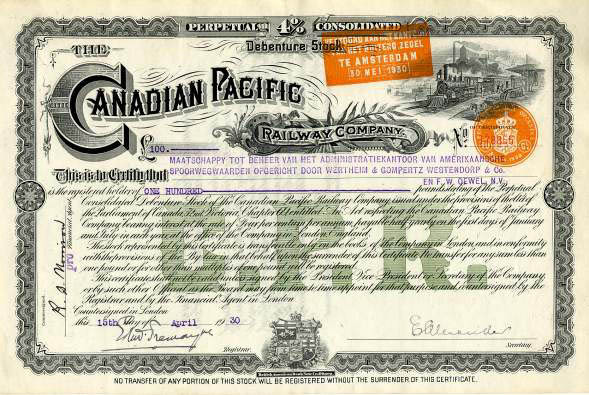 Canadian Pacific Railway Perpetual 4% Consolidated Debenture Stock certificate issued in 1930. 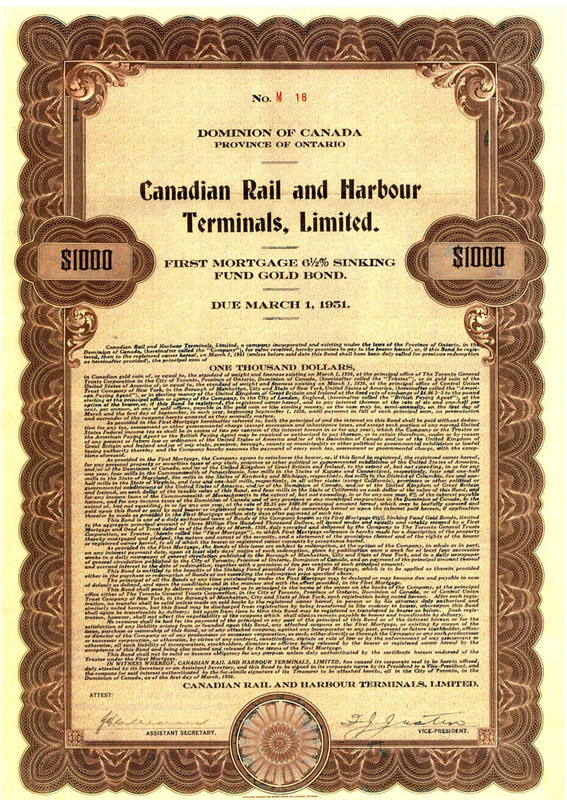 Canadian Rail & Harbour Terminals bond certificate 1926. 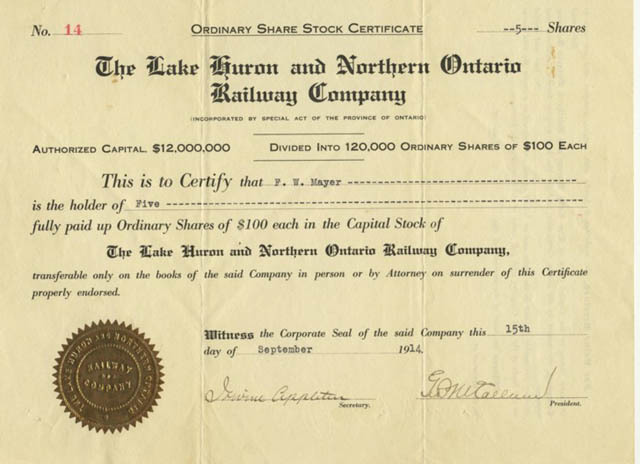 Two stock certificates of 1914 inc. un-issued. 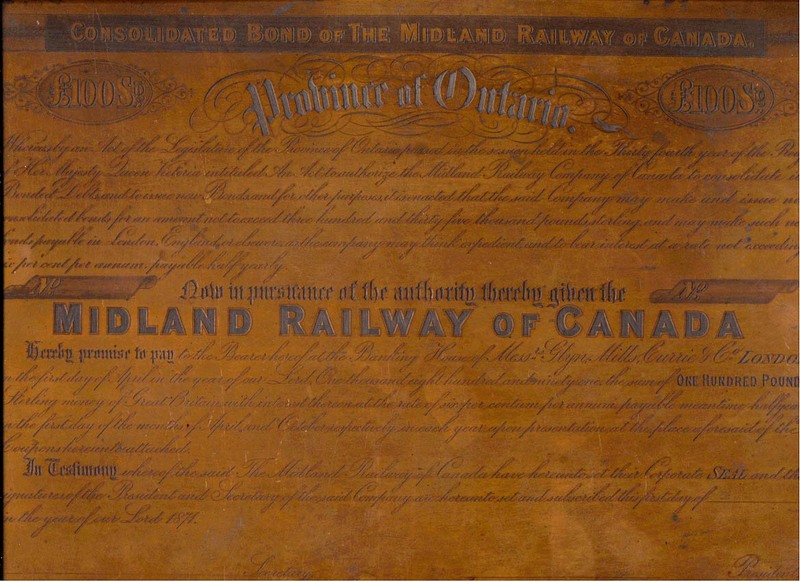 Midland Railway of Canada original printing plate for 100 pound Sterling bonds of 1871. If you know of an old intaglio printing press to print with, please contact me. CNR Lease for Section House in Daventry, Ont. 1926. 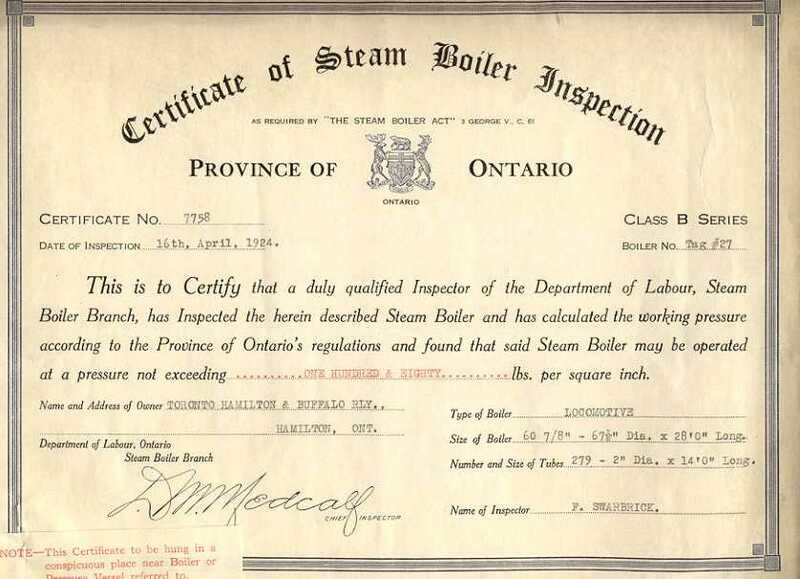 Certificate of Steam Boiler Inspection Ontario Government approval of Toronto, Hamilton & Buffalo Ry. locomotive boiler used in shops,1924. 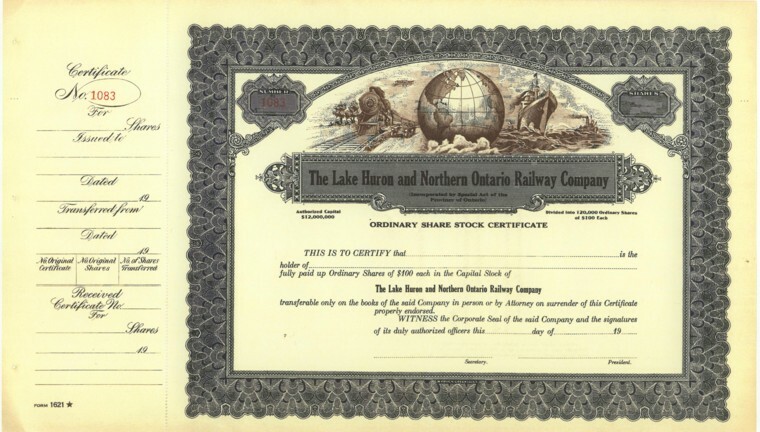 Issued to locomotive engineer John Andrew McNish. CNR Track Maps Belleville, Peterborough, and Toronto. Canadian Steam Power Catalogue containing many erecting card and other scale drawings. Advertising Ink Blotters a once common method of advertising used by businesses of all kinds including those in the railroad industry. These are from the Old Time Trains Archives. CPR Diagrams of Train Signals. Chart issued June 1941 - Shows position and colour of signals to be displayed on locomotives and cars. CPR Track Signs. Chart revision of April 4,1977. - Shows and explains various signs displayed alongside tracks. Cab Forms: The all-important documentation required for every locomotive. A look at one from the days of steam on the Wabash Railroad in Canada. A Train Order from 1918. A piece of very old paper tells an interesting story if you know how to interpret it. A very old Rule Book. A brief look at parts of a C.P.R. rule book which took effect on August 1, 1890, bearing the famous name of W.C. Van Horne, President.